Hello to all of those out there far and wide that have been following the progress as I get closer and closer to the launch of my very special personal project: Newcastle Old and New - the story so far? A “book” about the changing face of our fair city Newcastle upon Tyne and a tale that takes me back 38 years to my dark days at school where I struggled with dyslexia and that this book I created was the only proof I had in that I wasn’t as stupid as constantly told by my teachers of the day [thankfully society has changed]. The book at the time was part of a final year history exam which gained surprising high praise and an “O” level pass, a massive achievement against a sea of despair – so let’s lighten the mood and get “back to the future” so to speak? In this month’s newsletter I will have another couple of sneak previews from the book including a brief part of a poem about the Tyne Sea God, of which the status can be seen on the side of the Civic Centre and also a little bit about the Metro system – I know these are two strange items to included in a book to do with the history of Newcastle? Well that’s my job as I see it – to make people aware of how the everyday items, sights and objects that you drive or walk pass do have their place in this crazy metropolis we call Newcastle! Oh and another question, with the answer to last month’s and the winner [sorry no prizes!]. I am the Tyne River God. You may not believe it but the Tyne has a “God” and it has looked over the city for many, many years, watching over the city’s development over eons of time. 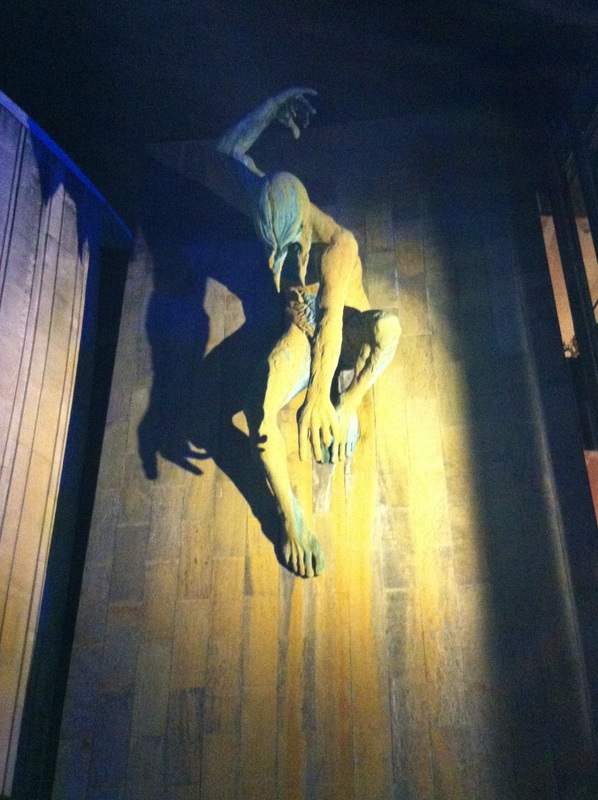 It currently resides on the side the Civic Centre but there are also other representations around Newcastle. There is [or was] a night club called Sea which sits beside the swing bridge on the Newcastle side, above its entrance facing the Tyne is a small figure of the god – best seen from the High Level Bridge. But surprisingly there is a large bust of the Tyne Sea God on the side of the Newburn Boat Club to the west of the city – and I bet you thought, Newburn’s got a boating club eh? 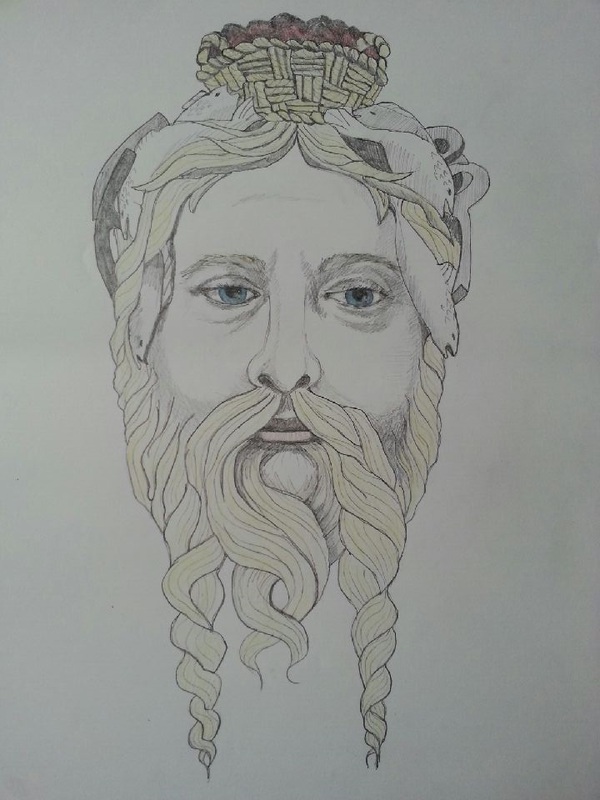 Below I have two pics, the first is from the side of the Civic Centre and also a sketch recreating the Tyne God complete with shoals of fish and burning coals in his hair to represent the two main industry’s on the Tyne many years ago, skillfully drawn by Claire Hakin; a brilliant artist who is one of many who helped me with my book. 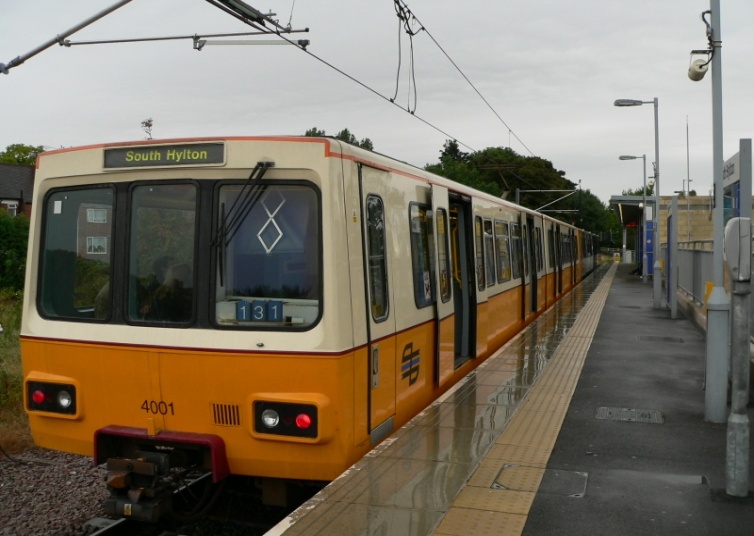 The Metro Rapid Transit system was launched in 1980 and 35 years on it has increased its original track by a third and has 60 stations throughout Newcastle – and even reaches to Sunderland! The Metro moves something like 38.1 million people per year [figures for 2014 – 2015 according to Wikipedia], It is now such an integral part of the delicate balance of transport systems Newcastle has for moving people into and out of this busy and thriving metropolis of a city. In fact combined with the Newcastle By-pass on the A1 [being widened as we speak], the Central Motorway East and the New Tyne Tunnels [two of them now!] all combine to move hundreds of thousands of people in and around Newcastle upon Tyne - the balance is so fine that when one of these systems goes down for whatever reason the effect is certainly felt, as many locally will testify! Which, just goes to show how much of a foresight and vision the Metro was back in 1977? And of course not forgetting that, not only has this brilliant transit system been copied many times throughout Britain, but also throughout Europe. Clearly they were “on the right track” with this brilliant and innovative idea all those years ago? Question time; here is this month’s question for you [sorry no prizes but I will publish the name of who first comes back to me with the correct answer in next month’s newsletter]. Q: the Metro track has expanded by a third in length over the years, from the coast to the airport, from Newcastle Central over to Sunderland. How many kilometer’s of track is there now?? Last month I showed a lovely picture of the Millennium Bridge being carried up the Tyne fifteen years ago, I asked if you could tell me what is the official name of the huge yellow sea crane?? Thank you to all who took part in this light-hearted quiz! 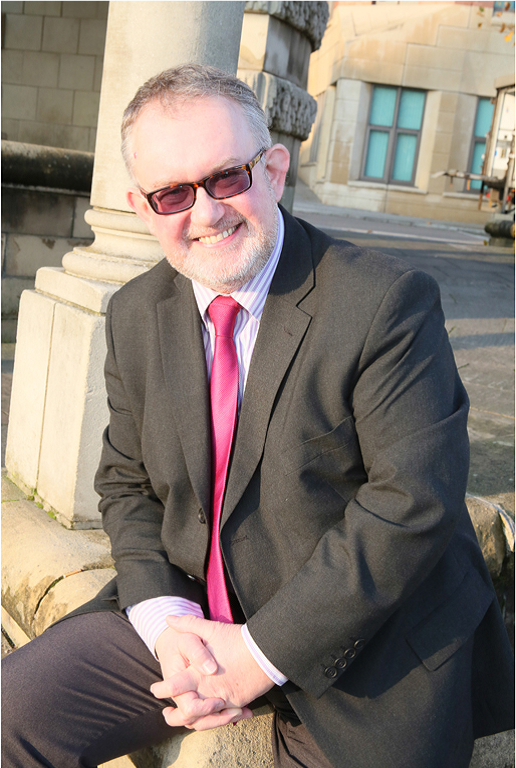 Well, time to close and move on to doing some work for ME PAT Services ..... Ta ta for now and thank you from the bottom of my heart for your time in following in our progress and the interest shown in my campaign - it is so very much appreciated!! !